You may begin wondering whether you have a blogging "problem" when every time your camera is whipped out you get an "is this going on the blog?" comment. How often does this happen to me? Pretty much every time there's another adult in my picture. But it's always nice to find out people actually read what I write. More than occasionally I feel like I'm talking to myself here in bloggerspace. 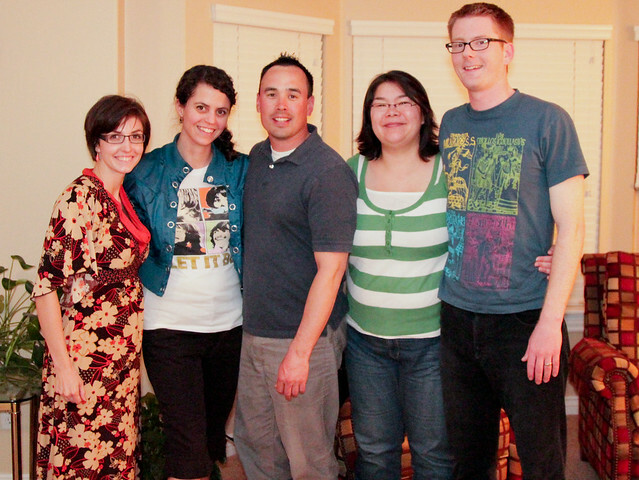 I slipped out last night to visit some out-of-town friends from college, most of whom I haven't seen in years. My, how we've all grown up. I was the only one with kids who managed to make it to this shin-dig (thanks to my lovely husband) and I got to contemplate lots of deep and happy things. God's good to me in the "landing lovely people in her lap" department. I'm so happy you got to spend time with friends. I'm totally laughing about the going-on-the-blog comments. My husband has stopped asking and just assumes it will. You look lovely and it sounds like you had a fun time. I've only gotten a few going-on-the-blog comments, so I cherish everyone! A night to rejuvenate with friends is priceless.